That's some badass analysis, Brent! I'm not having any issues, but I was intrigued by this LatencyMon thread. Here are my results, taken recently while tuning around, having a QSO, running PowerSDR, DXlab, Chrome, VMB, VSPE, Pidgin. Latency mon is better than my currently used i5-4460 .... but it still says unacceptable typically in an hour or so of running - always tcpip.sys. So how does one go about finding out whether or not I have the latest version (and then how do you upgrade it if you don't)? I have upgraded everything on the computer from the "brand new out of the box" state using HP's facilities ... that included BIOS, Graphics, Audio... nothing else is being reported as needing an upgrade... my suspicion is, since Windows was the first thing it upgraded (to the latest) it has the latest tcpip.sys ... so I think this is a red herring and i'll not be able to do a great deal (read: anything) about it ... it is currently using wifi as its in the dining room and not connected to ethernet as it will be when in the shack. actually the passmark on the CPU is 14842! This is the main LatencyMon topic. It is the only topic with the title "LatencyMon...", which a quick search easily reveals. I have moved your posts here. I am by no means an expert on how to solve LatencyMon reported problems. I have had good luck updating drivers, and finally built a new, very fast, computer. I use a combination of Windows Update, PC manufacturer update utilities, and specific, individual component (e.g. NIC card or NIC chip) update utilities. One very good idea is to disable devices and/or services that are giving you problems to confirm they are the source, such as Wi-Fi NICs, etc. After that it tends to be a lot of googling to see if anyone else has lucked onto the solution. Mostly you find the best info on gamer and DAW websites, since those are really the only other demographics that are badly affected by these problems. I don't think I'm writing anything you don't already know. Unfortunately it is not always an easy problem nor an exact science to make LatencyMon happy. Thanks Scott... unfortunately a search is only as good as knowing what to search for - I searched for Latency Monitor, not LatencyMon! So now they're both linked to the same thread. Ok - I'll keep trying to find out where I get access to tcpip.sys... I looked under Device Manager and wasn't able to locate it under many categories ....I'll keep searching. Well, hmmmh. Soooo, let me see if I got it: 20 some pages later, MS is still working on it ("we feel your pain"), the thread finally gets into the 21st century, a few posted highly meaningful, good-looking LM results for exactly 6 seconds (exaggeration, kinda), traffic on the issue died out (most likely out of frustration) and still no apparent generic solution. Distilling what seemed pertinent, I decided to experiment with some NIC power settings although I am no longer experiencing any audio glitches of any kind. I have long since found and disabled every possible power saving feature in the BIOS and Win 10. However, I found and disabled the "Energy Efficient Ethernet" option on the Advanced menu of the dedicated NIC in Properties and did notice that when I powered HPSDR back up, I had "0" under/over flows and "0" OOOPS from the git-go. I have never seen that before. Usually, there is some initial instability and then it becomes highly stable. Time will tell if that is meaningful or another rabbit hole. Stay tuned. Time will tell if that is meaningful or another rabbit hole. Stay tuned. So I ran my current shack computer, an i5-4460 on LatencyMon again - ran it for over an hour - never fell out of "suitable"! This new super fast i7 within 30 minutes would fall out ... frustrating. Then I found a setting I hadn't seen before. Under CONTROL PANEL | SYSTEM | Advanced System Settings | Advanced then the top line "Performance, settings" selection ... it was defaulted to "let the computer decide", changed to max performance and restarted the computer. Now the i7 seems better - it has run for as much as 90 minutes without falling out ... but eventually it will. Now more so with the second line "highest measured interrupt to process latency" ...and there is no indicated 'chief offender' listed for this one ... searching for this one I've not found, surprise surprise, a solution or even a good method to track it down. I've got a few days before I run out of time to return this computer if I decide to do so ... so far other than passmark its not been an overwhelming standout. Maybe just having a very fast processor just isn't enough. I ask about the values because thinking about it - just simplistically, a 1mS latency in response back from an interrupt would mean a huge loss of data for a 92Khz stream ... or at least it seems. Yet that isn't the case - so I wonder how the numbers relate overall. It sounds like you are making progress. As for where LatencyMon and DPC Latency Checker set their pass/fail limits, I have no idea. I'd suggest, however, that anything that stalls the primary DSP processing thread in PowerSDR (or Thetis) for longer than either a half or certainly a full DSP buffer time period is likely to generate bad results. I'm guessing quite a bit, but if we use the DSP buffer size in Setup > DSP > Options as a guide, then consider that 64 IQ samples at 192KHz sample rate = 333uS. I'd further suggest that the real problem is in time spent away from the primary DSP thread is the real issue, not problems with VAC. The audio runs at a sample rate of 48KHz. With a buffer size of 256 samples that's 5.3mS, which is a long, long time. CONTROL PANEL | SYSTEM | Advanced System Settings | Advanced then the top line "Performance, settings" selection ... it was defaulted to "let the computer decide"
and this improved or reduced the latency issues on the new computer .... with this setting alone it went for 10 hours without 'tripping' .... I did the same setting on my current radio computer, the i5 ... and after having shut it down and back up again noticed that the fonts were woefully dim and thin and ill-defined... it was this setting! So the trade off is performance for poor visual display .... a real shame. 1) I went to the advanced settings on my network card that attaches to my Anan 8000 board and set virtually everything OFF/Disabled. I increased both receive and transmit buffers as high as they would go, 2048. I did leave "Interrupt moderation" enabled and the moderation rate is set to "Adaptive". I also have "Packet Priority" enabled. 2) I then found that under DSP Options, SSB/AM TX buffers MUST be higher than 64. I tried 128 then settled on 256 and that seemed best for me. I set all the other TX buffers at 128 for CW, FM, and Digital. 3) I use VoiceMeeter Banana and have the Behringer UMC202HD. My buffer settings on the UMC202HD are 128 samples. Safe mode unchecked. In VoiceMeeter I have "Buffering ASIO" set to default. All my sound settings are as Scott suggested; 48khz. I use 24 bit. I'm sure 16 bit is probably fine too. All of the above had to be done to get to the levels I'm now running. My CPU is an I7-3770. Not super fast. It runs a Passmark of 4674, CPU Mark of 9552. I typically run Firefox with multiple screens, including radar tracking, Dxmaps, my local security cameras displayed, all the DxLab apps running, JTDX, and JTAlert, and email (Thunderbird). So lots of apps running. I don't know if any of the above settings might help you but thought I would provide what I had done here just in case. I can try setting the buffers - although I'd have thought I'd be setting the DIGITAL one and not SSB. Also the CW/FM have no bearing on this I'd guess and they're working fine so don't want to mess with them. Possibly you use the VAC connection for all and thus it might be germane for your setup. I notice that WSJT doesn't decode all that well sometimes... signals are clearly there and nothing decodes ... and wonder if this has something to do with the radio settings. I do know that on TX I see these burps and bubbles and splatter (as a general term of what it is) that is at times only 35 db down from the peak signal (using DUP, not there without DUP)... Scott wants me to post a picture of it - I'll need to do a video as its only there for the briefest of moments and there is no "freeze" function for the display (its on my list of "wants" turned in to the development team, probably very low priority) ... one of these days I'll get it done. I've been busy working new ones on 6 ... started the season with around 56 countries - now at 94! Thanks for the info though - I'll see what I can get out of it on my setup. Have a great day. I supplied the info for all the modes the radio operates but certainly digital is your focus so I would try setting that to 128 buffers on the filter page, if it is at 64 and see if that makes any difference. I also run digital modes at 48K rather than 192K where I run all other modes. This seems to work much better for that mode and certainly anything above 48k is unnecessary on digital mode. I noticed this year you guys to the East of us here in the Atlanta area seemed to get more of the "E" cloud than we did. Congrats on the big pickup in 6m countries! I picked up quite a few but nothing like you did. If I were you, I would try connecting my NIC directly to the Anan rather than going through a switch/router just as a test. Obviously there is more latency going through a switch/router path than a direct connection to a NIC from the radio. For this test I would also turn off the different advanced options on the NIC as I discussed above before assuming it makes no difference initially. I tried playing with Affinity some time in the past but discovered it didn't "stick" and you would have to reset it every time you started the App and some Apps changed it even while they were running so I had no luck with this setting. It sounded like a good idea as I noticed that most apps don't use all cores; most use just the first one or maybe the first two. My thinking was I could assign HPSDR to cores 7 & 8 to get it away from most other programs but it just didn't work out for me to solve the latency problems I had then. Also, as Scott has stressed many times, everything in the audio chain MUST be set to identical levels; 48K and either 16 or 24 bit. If not, problems are sure to occur as I discovered when I missed one. Missing one is not hard to do as there are so many in different areas to keep up with. Such a pain particularly when Microsoft deems it necessary to undo what you've done frequently with updates. They seem to love to screw with the audio settings with almost every update. Your mentioning of the "burps and bubbles" on transmit reminds me of what I saw on SSB (and have seen on FT8) with PureSignal OFF and running a two tone test and seeing what I thought looked like a "irregular shaped cloud" popping up from below on the waterfall frequently. This happened even with VAC OFF. The problem causing this turned out to be the TX buffer size settings on the "DSP Options" page, as I mentioned earlier. I had it set to 64 and found it had to be at least 128 to mostly get rid of this problem. Even at 128 I would occasionally see a burp so I settled on 256 and it seemed to completely eliminate it. This was why I mentioned I set all other modes to 128. Some were set to 64 previously. Those may need to go to 256 also but I haven't tested them all yet. This "cloud" looked very similar to the display anomaly caused when running PureSignal with the noise blanker on in previous versions of HPSDR which made me think it was just a display issue but when I ran PureSignal with the buffers at 64, I saw a glitch in the "Amp View" display of PureSignal every time I saw the "cloud" popped up so my thought was it is a real problem and not just a display anomaly. I thought I would update you on my fooling around with Affinity today. I decided to play with it to see what I could discover. I assigned PowerSDR.exe to cores 5,6, & 7. I assigned all the firefox instances, JTDX, and JTAlert to cores 0 thru 4 as these were the major users of CPU cycles. I then opened resource monitor and just watched the different cores and I did notice a distinct difference in cores 5,6, & 7 compared to cores 0 thru 4. There was indeed less total activity. This didn't really help me as I don't have issues anymore but it did clearly show that most other traffic was off of cores 5,6,&7. Here is the picture of the cores and as you can see the majority of usage is on cores 0 thru 4 now. and I tried changing PSDR to just one core - core 6 on my i5 (6 cores total) ... there was no change that was obvious. The CPU usage was the same as I'd expect it to be ... note my thought on this is that if one were to do this you'd want to have the programs you're concerned with, for example WSJT, set to the same core .... the purpose here being to reduce the chance that it will be on a core that has something that has long latency and as a result be held up by it ... of course without knowing what that program is (although LatencyMon tells us the worst case one(s)) we can't eliminate it but we might reduce the frequency. As you can see in my picture, cores 5, 6, & 7 are obviously not following cores 0 thru 4 and are running at a lower cpu rate so the Affinity change worked for me. If you only moved the programs you wanted to core 6 and did not prohibit other programs from using Core 6 then that may be why you didn't see a change. You can't just move PowerSDR (and your other stuff) to Core 6 without removing other programs from using core 6 too, otherwise you haven't accomplished anything and in fact you may have hurt the apps you moved to core 6 as they now have only one core to operate on along with all the other programs that are using core 6 and all other cores. Agreed ... however there are LOTS of things running ... I don't know how programs that do not run multi-thread (if that is the right term for actually using multi-cores by design) end up using a core ... if they are only typically on a core - then unless there is some randomness on how they're assigned I'd think that there might be a tendency to overload the lower core numbers - that was my assumption. So I selected the last core (which by the way on this i5 is actually core 3, not 6). That's what I was going with. But first and foremost i need to figure out a way to see my cores as TM is only showing the CPU results - I know I USE to be able to see cores - not sure why they removed/moved it on Windows10. Also apologies for not being explicit... when I said it didn't change I meant there was no obvious bad result - it ran as normal with no visible (or audible) effect. I have since played with it a good bit more - this time looking at turning on the resampler which previously never resolved and was always hunting. With both PSDR and WSJT on the same core - nothing else changed, I was able to see what appears to be an improvement in the resampler - there were times with certain settings, changing the Buffer size and the Buffer latency value/manual(auto) where it would settle down - only a single digit changing for a good couple of minutes ... but ultimately it too would 'run-away' with a sudden rapid change in the ratio and huge jumps in the OF/UF numbers ... so I don't know if that is 'better' or if it is just different... it was indeed different... I realized later that I really need to put VAC-M on the same core as well - but I've no clue where to find it in the services or details tab in order to change the affinity. There's nothing obvious - I could use help here if someone knows what its 'details' would be. This is just an experiment - I agree with you that moving things off of the "radio system" core would be ideal - but unless there is a way to automate that we're just adding to the (already) many tasks required at computer/radio startup time ... I'm currently looking at a slightly less onerous set of changes to see if that improves things noticeably. so that new computer that i have ... it is an i7-8700 3.2Ghz ... it ran a 14800 on CPU/Passmark test 2 weeks ago or so ... today when I run it it is anywhere from 11500 (tops) down to 10000! WHAT CHANGED? I can't figure out why it would drop so much. That is a huge difference and its now running about as fast as my 5 year old i7-4770. The "nominal" for this new CPU is 15200. The only thing that I can think of that changed is that I installed a Samsung NVMe SSD (it is blazingly fast). I probably installed some programs since then - I'm sure i did - but I've disabled any that come up in the STARTUP and don't see any change in the results - still 11K'ish. I have searched on the internet to see if there's anyone that has had Passmark results that changed this drastically - nothing found. Has anyone seen this (and hopefully resolved it)? and yes, It is using all 12 processors. I have seen similar changes in the Passmark ratings of my PC. It has never been as fast as the first week I had it running. It would seem that as Windows gets clogged up with the detritus of normal, daily operations, the system does tend to slow a bit. However my changes are not nearly so dramatic as yours. I'm tempted to return it, the result I'm getting is in the bottom 0.1% of all submissions! FWIW, my Xeon is still performing about as it did originally and still at or above the average results on Passmark with very minimal OC-ing. I have not seen any deterioration in performance over the last year worth noting. I even ran Passmark with PowerSDR, ASI, Omnia and other software running and found only a slightly reduced result. Gary, I can't imagine what would be knocking down your performance to that degree. so I spent the whole d#$* day working on it ... I went back to the original HDD alone, tried the SSD alone... tried various settings etc ... always the same results - around 11500 ish when the first test gave me a 14480 and the nominal is around 15250. I even saw one result that was at 10,700! That is a 30% drop. I spent over an hour on the phone with HP support. Of course they want to dismiss it. But the differences in performance are not mind blowing when you get up there as we all know - but you DO pay for those differences! I ran PT on this computer - a 5+ year old i7-4770 ... results were right on the mark for this CPU and not much worse than what I'm getting on this new one... then I ran it on my current radio computer, an i5-4460 - again right on the mark, actually about 8% higher than nominal. This was with no changes, nothing turned off from the start menu - not even removing any of the other "stuff" running like the virus program etc. So obviously the test is as they say it is - designed to test the CPU performance with little impact from memory/disk/video and other things running (within reason I'm sure). These are both Dells, the new one is an HP. As a post script. I ran a full Passmark benchmark and found significant deterioration in my GPU 3D score and hard drive score which are now far below normal. Again, no noticeable deterioration in GPU 2D, CPU or memory scores. I am contemplating doing a full burn-it-down and reload from a bare hard drive. I have periodically done that for years and it has always helped eliminate the glitch build up, which the signs are now pointing to. Gary, you said you did an "OS recovery." Not sure what you mean by that. Did you take it all the way down to a reformatted hard drive level? Hey Brent - I fancy myself a history buff - but I can't tell who the picture avatar is ... ? So ... I just did an OS restore. I believe all computers now ship (if pre-built) with a partition on the HD with Windows files/installer. So I just ran their utility to do that. It bought it back to where it was when first received. That stated: I think I know what it was. So I had it new - I did the test and got near nominal results for the CPU. 14840 vs. nominal 15250 or so. Then I started to go through Windows to find things set for a balance between power and performance (which was everything setable) and set all that I could find to performance... I installed the programs needed ... finally installed the new NVMe SSD. Oh - and to be sure I went to HP's site for this desktop and found any and all drivers that were not the latest and installed them. This included the BIOS. 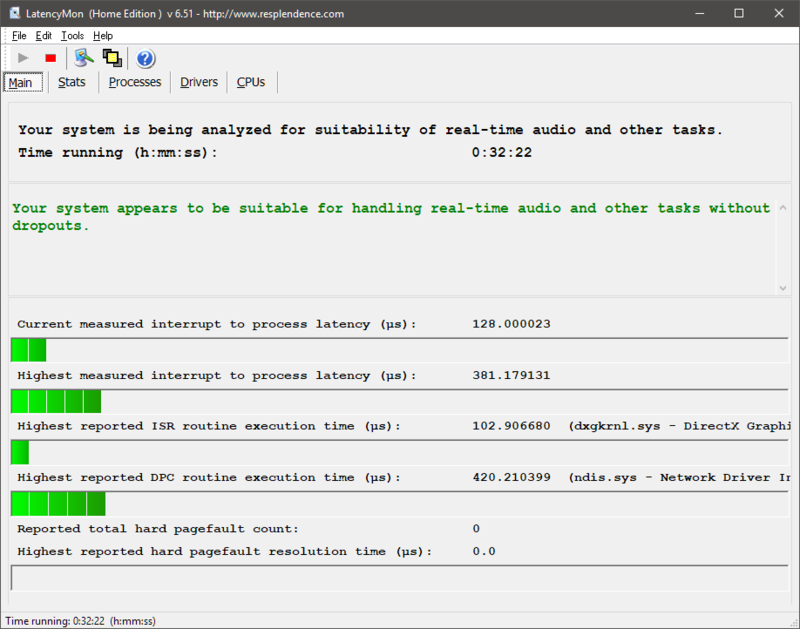 It was at that time - checking things out - setting up the programs, logger, audio, Dtime, etc etc that I re-ran the performance test and got the low CPU results. The results were best case down 22% and worst case down 30%. I found out yesterday, on the HP Forum, someone posted that apparently Intel introduced a bug in their processors in their never ending quest for faster performance - that made them hackable. To fix it you needed to ALSO repair (upgrade) the BIOS. I was not aware of this when I upgraded the BIOS above. Apparently this "fix" caused performance degradation to the tune of - wait for it - as much as 30%! Some were reporting 50% reduction in certain games etc. So since i went back to the original shipped computer setup with only the bios having been changed and it worked pre and didn't post the bios change - it had to have been the BIOS upgrade that did it. By the way I bought this from Staples, had run past the allowed 14 days for returns (at about 24 days) due to issues getting answers about the SSD drive and then this issue with a drop in performance where HP hadn't a clue with hours spent with their support. I was denied the ability to return it - so I called their customer service and talked to a supervisor. I explained the situation and she was kind enough, it was reluctantly, but kind enough to allow me to a) do an exchange for a new unit to see if there was something wrong with this one and b) if that doesn't work get a refund. So kudos to Staples. I normally would not have pushed it so far out except I thought it was a 30 day exchange policy. Yes, yes, I remember the hack issue and the fix that would slow down the CPU. Good catch. At the time I heard the news, I checked to see if my Xeon was problematic and found it was not. So that may explain why I saw no slow-down on my CPU but, like Scott, I did see deteriorating scores over time on other systems.